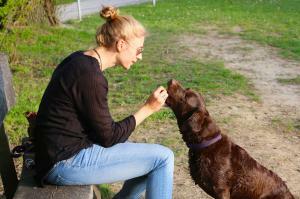 Giving our dogs the occasional treat or scrap is something many of us are guilty of. But with canine obesity a growing problem, are we just contributing to the epidemic? Addressing obesity in dogs is a sensitive subject with many pet owners, but it is an extremely important one that can affect the quality and span of your dog’s life. In 2014 the PDSA reported that 1 in 3 UK dogs are overweight, and the problem has only worsened since. But being even slightly overweight can have huge consequences for your dog’s future. As well as reducing life span by as much as 2 years, overweight dogs are more susceptible to health problems, including diabetes, heart disease and cancer. All dogs are different, even within breeds, so it is worth getting your vet’s opinion on what a healthy weight for your dog is. Ask yourself, does my dog have a potbelly? Does my dog have a waist? (When viewed from above, does the body taper after the ribcage?) Have a feel, you should be able to feel the ribs without pressing through too much cushioning. If you suspect your dog is even slightly chubby, get along to the vet for a check-up. The average dog that is ‘suspected chubby’ is usually at least 15% overweight! If your vet believes your dog is overweight, they will probably recommend a calorie-controlled food. These are usually formulated to prevent weight gain, not to promote weight loss. Your vet will advise how much of this you should feed each day and, if you prefer to feed twice or three times daily, may suggest you weigh it out and then divide it between the meals. This method of feeding is usually better as it helps to reduce hunger and begging. According to the PDSA, one of the biggest causes of canine obesity is owners not following the feeding guidelines specified on the bag of the food; either they guess at the right amount or they feed on demand. This means that many dogs are getting as much as double the recommended amount, and this is without the addition of those daily treats. Dogs on a calorie-controlled diet need to be fed an amount of food based on their ‘target’ weight, not their current weight. This is usually about 15% less. You don’t really want to reduce their daily intake any more than that as it might mean they’re not getting the right balance of nutrients. If you did want to continue including treats in the daily ration, something low calorie like apple or rice cake would be a more suitable offering. It is important to keep your vet involved in the weight loss program and schedule regular check-ups while your dog is dieting. A healthy rate of weight loss is 1% weekly. When your dog reaches the ideal weight, don’t let things slip but continue feeding to the guideline. Exercise is also fundamental for weight loss in dogs, just as it is for humans. If your dog is burning off more calories than he consumes, he is going to lose weight. Your vet will check your dog is in good health before advising you to up your dog’s exercise regime. Finally, it is vital that you are patient and don’t expect immediate results. Crash diets are strongly discouraged as they will completely jeopardise your dog’s health. Remember that weight loss should be gradual, taking months as opposed to days or weeks.